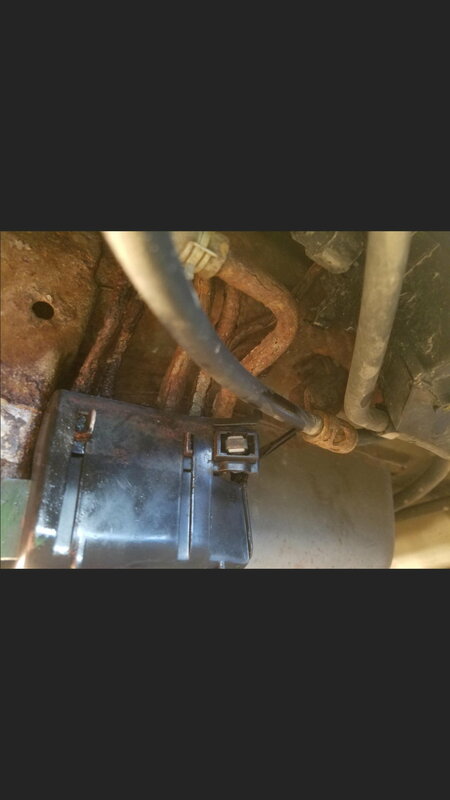 I am working on replacing the rear brake lines on my 2002 Acura TL type S.
I am trying to remove the covers #34 and #35 which cover the brake lines and fuel lines. remove all the #51 CLIP, FUEL PIPE (91598S84A01). How do I separate the pipes from the cover I don't want to deal with the fuel lines now and if I just pull the cover down enough to try to see how the pipes and clamps are held in I am afraid I will break something. I may be wrong it looks like there are U-channels in the plastic covers and because the fuel lines have some corrosion they have expanded to cause a pressure fit in the U-channel. I tried using a screwdriver to pry the fuel lines and they seem to be releasing from the covers. I will work on this tomorrow if it is not raining as I am working outdoors. Leaking brake fluid now fuel. Brake lines and fuel lines are rotted together to the cover. Tried to remove the cover, now im leaking fuel. The lines look like this the whole length, does anybody know what size pipes i need to replace the fuel lines for a 2003 acura TL Types S? I used 3/16" Copper Nickel Roll from ebay and used plastic spiral wrap to protect line near the wheel well and metric fitting on the ends for the brake lines. I think that Copper Nickel Brake Fuel Line Tubing Kit 5/16 OD with compression fittings would allow you to splice a section in the the fuel line, return line or vapor line but the original line I believe is metric.